Couponers love to brag. In fact, there are entire databases and websites set up to allow couponers to share their triumphs. Rightfully so, because couponing can help people score major deals. I’m not talking about 50% savings. Couponing brags usually include drastically discounted items, freebies, and moneymakers. Still, I’ve been in the couponing world long enough now to know that sometimes the math just doesn’t add up. Case in point? Last month, on my noble quest to slash my grocery budget to $200, I bought frozen pizzas. This purchase was partly because they were on sale for a great price and partly because I needed to convince my husband not to abandon ship. In two years of marriage, I’ve learned not to mess with his food, and I knew that the prospect of slashing the grocery budget was making him awfully nervous. So, I set out to pick up four peace offerings to stash in the freezer for some days when cooking just isn’t on the menu. The DiGiorno pizzas were on sale 2/$10. If I spent $20, I would get an immediate $5 taken off my bill. Four pizzas for $15 was too good to pass up, so I scooped them up and headed for the checkout. As I shuffled out of the checkout line, the cashier called me back for a coupon. The thing is, it wasn’t any old coupon. It was an unadvertised Catalina. A Catalina is a coupon issued by a manufacturer that gets triggered when your purchase reaches a certain total. Sometimes the Catalina special is advertised, some it’s not. This particular coupon was good for $3 off my next purchase of any item in the store – no minimum, no brand requirements, nothing. It’s a pretty sweet deal. And in couponing world, a brag would state that the pizzas were 4 for $12. Wrong. I paid $15 for 4 pizzas. The next time I shop at Jewel, I’ll save $3 from that purchase. However, most couponers operate under the mentality that they spent $12 and will also share that they saved $3 less on their next purchase. 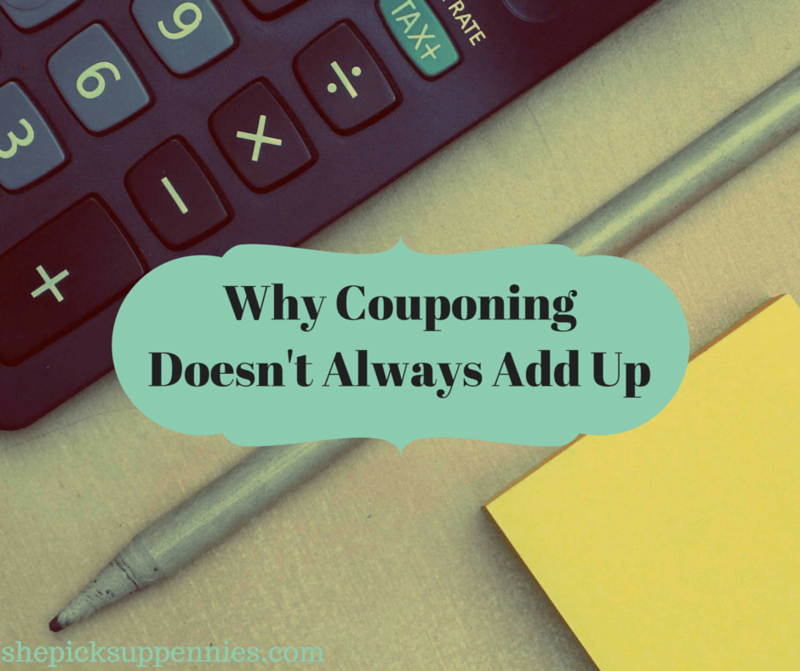 For months, deep in the throes of extreme couponing, I was stumped as to why my budget never matched the brags I saw online. This math mistake is partly to blame. So if you’ve ever come across a couponing brag online that seemed too good to be true, there’s a chance it just might be. Ah, frozen pizza, our staple of existence. I don’t think my husband can survive without it much longer. I am so bad at couponing. I always end up with coupons for things that are cheaper to buy if I go with the store brand, so they sit in my purse unused until they are 3 months out of date. That’s such an easily overlooked point. If I can buy it for less at Aldi (or the store brand wherever else), couponing isn’t a great deal. Yep, thinking too far ahead of savings means trouble. Otherwise, those 4 pizzas were $12 *and* your next grocery purchase will end up being $3 off too. Because our memories aren’t great — and pretty selective to boot. FYI, I try to put money away in a special account when I “save” money. It means those savings are actually, well, saved. Just a thought. Yes! I use the TipYourself app and always toss in a little extra when I save with coupons or sales. I hate couponing. I’ll do admatch though. That’s easy and awesome and doesn’t have to apply to processed foods. I will price match at Target. I make it a point to avoid my Walmart – it’s a headache morning, noon, and night 🙂 But ad-matching is such a smart way to save! Ahh couponing. I always forget I have them, and it continuously creeps me out when the grocery store spits out coupons of items I buy frequently after I check out (you think I would be used to it by now…). Every once in awhile I do use them! Our local grocery store gave us $40 off our total bill (with $100 minimum, which we easily meet because my fiancé & I make all three meals from home) when we moved to our new apartment. Every once in awhile the coupons can be captivating, but oftentimes they rope you in & end up costing you more in the end! So true! If the manufacturers and stores didn’t profit off them in general, they wouldn’t be offering them. It can be – you have to factor in your time, too! We don’t have coupons. Not enough competition in the Australian grocery industry… yet. It’s definitely about balance. I’ve made some huge couponing mistakes in the past and think I’m more sensible now. Especially with beauty products – I would always think, Oh, nail polish for 49 cents. Can’t beat that! It might be dirt cheap, but if you have no use for it, it’s 49 cents down the drain. I don’t really have the patience for coupons anymore. I did at one point in my life, but now I would rather do something else on weekend mornings! I will use coupons if they are right in front of my face. Kroger also mails me personalized coupons sometimes. I definitely use those. Target has started doing the same. If the coupons come to me, I won’t ignore them. But I’m done trying to be first line at CVS to get something that was never in stock to begin with. Now some of those brags are starting to make sense. It’s double dipping on the savings! RIGHT! And it irks me to no end. Also, most brags don’t account for sales tax. That might not seem like a big deal, but most stores don’t tax on the reduced sale price. They tax on the original item cost. So if your bill would be $100 of cosmetics, you’re paying tax on the $100 not on the $34 or whatever the sale price was.